NJHA Sweetheart, Kaisha Alber shows one of the three consignments from Schutte and Sons, of Guide Rock, Neb. She gets some help from mom Afton. Double Heart Diamond Cattle Co. owner, Dave Goertz, of Berwyn, shows one of the top selling heifers, a Sept. 17, 2017, calf sold for $3,200. GRAND ISLAND, Neb. 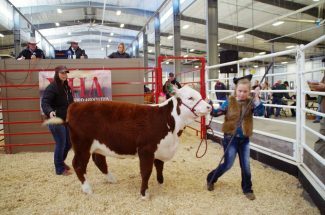 — The Nebraska State Fairgrounds, Fonner Park, was the location for the annual gathering of Nebraska Hereford Association members and friends Nov. 17-18. The Quilt room in the Pinnacle Bank Exposition building held the meeting of the Nebraska Hereford Women and the banquet the evening of Nov. 17. 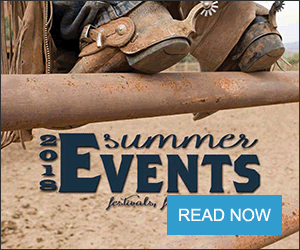 Nebraskans for Hereford Heritage brought their display of the metal sculpture, Golden Design 14 and the eight posters of the inductees into the Nebraska Hereford Hall of Fame that had many in attendance refreshing their knowledge of the history of Herefords in the state. The Hereford Women of Nebraska since Nov. 19, 2011, are one entity. President Trudy Nolles, Bassett, conducted the business meeting of the women. The Nebraska Hereford Association held their meeting in the Nebraska Beef Pit room across the hall from the Quilt Room. The banquet was emceed by Brett Nelson, Burwell, president. • Young Promoter Award went to Andrew and Caitlin Blessin of VR Bar Land and Livestock at Kenesaw. • Heritage Award went to TWJ Farms — William and Julie Claybaugh of Carroll. • Breeder of the year went to Upstream Ranch, Taylor. The NHW sold logo items along with a silent auction held during the banquet. 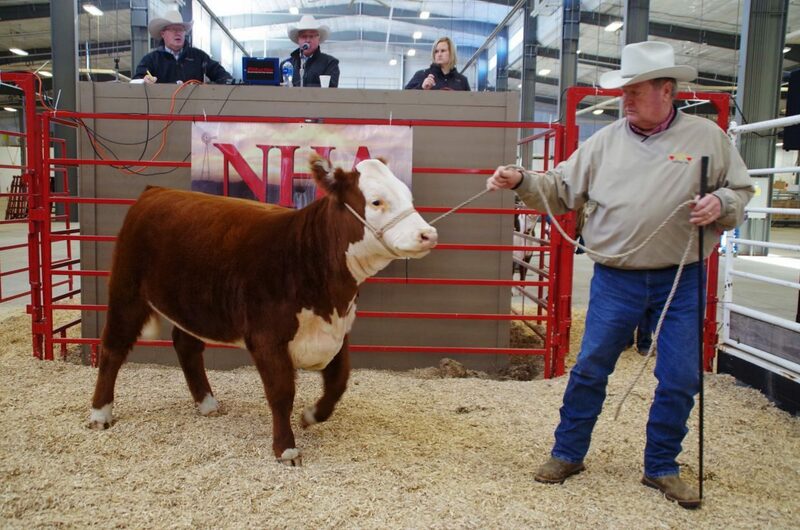 The $1,000 made at the auction goes towards scholarships and to fund the travels of the Nebraska Hereford Queen. 2018 NHA queen, Ralston Ripp from Kearney gave her farewell address prior to transferring her NHA banner to the 2019 NHA queen, Hannah Pearson, from Valentine. Pearson is the 17-year-old daughter of Wade and Michelle Pearson and is a senior at Thedford High School. Hannah and her older brother Seth started their family in Herefords when Hannah was 7 years old and got her first heifer. During the banquet, ads for the primary pages in the 2019 directory were sold, such as the outside back, inside front and back pages as well as the center two pages. 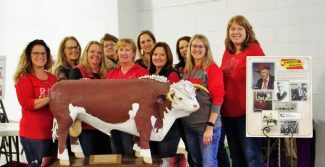 Sunday the NHW served lunch to those who had brought in the 31 heifer and steers calves, and the interested buyers for the annual Cornhusker Classic Show Steer and Heifer Sale. Nebraskans for Hereford Heritage again had their display set up as did the NHW which had their logo items for sale. 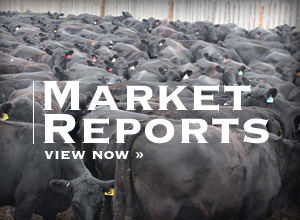 The 13 heifers averaged $2,133, with the top sellers, Frenzen Maribelle F-132 an April 10, 2018, daughter of KJ BJ 319X Laramie 649D Et and Frenzen Maribelle B27 for $3,200 from Frenzen Polled Herefords of Fullerton, as was Double Hearts' entry by Dave and Jessye Goertz, Berwyn – DHD Miss Diamond 7917 ET, a Sept. 9, 2017, daughter of C-S Pure Gold 0110 and C Bar1 0235 Miles 4408 ET. Eighteen steers averaged $1,557. High selling steer was Lot 15, Frenzen Frosty F37, consigned by Frenzen Polled Herefords, and sold for $3,300. Lot 23, DJ Full Throttle 829 consigned by Kraske Herefords of DeWitt was second high at $2,950.